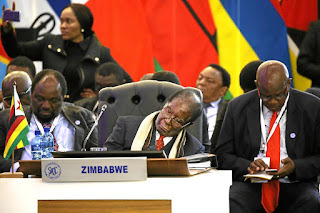 Zimbabwean state media reported this week that Robert Mugabe’s retirement package will include a fleet of cars, private air travel-about four oversee trips each year on a private plane and a house, all of these of course footed by the Zimbabwean government. Added to that, Mugabe will also get at least 20 staff members – including six body guards, according to The Herald newspaper. There are also diplomatic passports for him and Grace. Health insurance for him, Grace and ‘dependants’ is also included. While the exact details of how much all of this is going to cost were not revealed, AFP reported that the country’s constitution stipulates that an ex-president is entitled to a pension equivalent to the salary of a sitting president. Which cars will Mugabe get? What he needs those cars for, nobody knows. Those cars will be replaced every five years and the government will also pay for the fuel to run them. Nice, hey? And where is his house? Mugabe is entitled to a fully furnished ouse ‘anywhere in the capital’. He’ll also have his bills and ‘entertainment allowances’ covered. Media reports in Zimbabwe also claimed that Mugabe was given a $10-million retirement bonus sweetener – a claim the government has since denied. While Mugabe was still clinging to power, several reports suggested that he has a net worth of over $1 billion.